Not since John Ledingham was a captain.. The RAF are putting a new radar head back at Saxa Vord in the Shetlands. Bearing in mind it’s going to be a fixed remote head on a very remote site that they already own and probably still has all the power, comms etc infrastructure intact....it’s costing UK£10 million. Last edited by DeV; 30th May 2018 at 19:44. Giraffe was bought to provide guidance for FLAADS, it's a point/local AD system and Giraffe in an appropriate radar for that task - the surveillance radars are the three big AN/TPS-77 radars on the mountain tops, and they can see waaaaaaaaayyyyyyy the hell out into the South Atlantic. Aren't they a variant of the big phased array radars on American ships? How do you do that and what does it show? I can't actually remember the site - I'll dig it up tomorrow. Basically it's a line of sight calculator. If I am in X location, I can see something at 2500ft up to Y distance, or at 5000ft up to Z distance. The higher a long range search radar is located, the further it can see. I’m guessing the red areas are blind zones? So the red triangles are??? I expect the triangles are mountain peaks visible from that location. Re: red area, actually I think the opposite - line of sight down to (almost) surface level. Re: spots with reduced range- SSW due to Lug, ESE due to Djouce. So you can have a lovely long range search radar, but wherever you put it, it will have reduced coverage at lower levels in certain lobes - unless you stick a rotating dish on a jet at 35,000ft. Last edited by pym; 30th May 2018 at 23:34. Modern radars are much better at filtering out genuine known "blockers" like mountains, hills and tall infrastructure from spurious returns. Operators can select or deselect any object that the radar can see and they can select a bottom or lowest level so that the radar will, for example near an urban area, will not show objects below 200 feet, because of all the clutter you'd get. In the case of civil air traffic, given the proliferation of transponders these days, they can filter out VFR traffic from IFR, filter according to speed, height, direction, climbing, descending and so on. Even in Ireland, with all our hills and mountains, its very hard to hide even from commercial civil radar. There are very few true radar blackspots on the island. Didnâ€™t find it by any chance? There are very few true radar blackspots on the island. Yes. You would have to be hiding deep in the mountains to be truly out of sight to radar. Even back in the days of black and white screens and less filtration, a good controller could pick out low and slow moving traffic, such as microlights and helicopters from all the spurious returns. I was in the radar room in Dublin on a tour and mentioned that I flew microlights and similar aircraft and the controller was able to isolate several microlights active on that day (it happened to be a good flying day) and indicate where they where operating out of, several microlight airstrips that were not listed as approved airfields. I knew some of the lads involved and they believed that they were not on radar and that small microlights did not give a good radar return. They didnt give as good a return as a larger metal aircraft but they could be distinguished from flocks of birds, spurious returns from mountains, large antennae, pylons on hills and so on. Controllers get to know their area of operations very well and could pick out unusual returns very quickly. Nowadays, the picture has changed with the advent of wind farms, more hillside masts, higher buildings and more large objects in the urban and rural picture, along with a huge increase in microlights. Helicopters faded to near single figures after the collapse of the boom but they are coming back and tending to catch the eye of controllers again. You'd want to be doing some fairly good nap of the earth flying to avoid being seen on someone's radar. As can be seen the coverage against this level is "patchy" to say the least. While there will be arguments that no one is going to attack us it forgets what this means for organised crime. If next year because of Brexit we introduce tighter customs controls at airports and ports criminals seeking to import Class-A drugs for instance can easily fly a small aircraft at low level and be never picked up on radar. Last edited by EUFighter; 8th December 2018 at 08:56. Regarding some of the comments above:- with three primary radar heads, I believe there simply have to be some significant blind spots at low level. 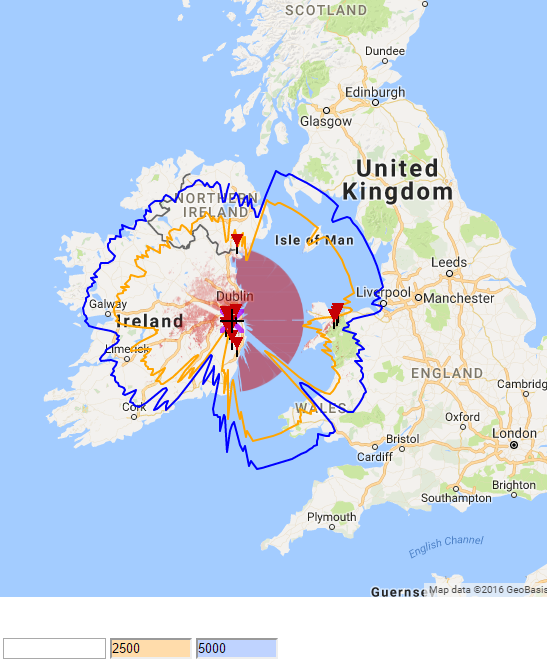 Advances in RF such DSP have aided radars in conditions like clutter, rain etc - however - you're not going to get a great Primary UHF radar return from an aircraft if your signal and the echo from the aircraft, both have to go through tons of granite in Co. Wicklow. I'd love to see a stress test of the system, be it civilian or military led - tracking a transponderless jet at low level is tricky for anyone. Well, three primaries probably covers most of the blind spots and are primarily concerned with airport traffic or high altitude crossing over traffic. What may be out of sight to one radar may be visible to another. You'd still have to work hard at it to stay out of sight to radar. As for drug smuggling via aircraft, the people who allegedly did it using an executive jet did so in plain sight; no need for low level stuff, which would have stood out as unusual. Rather, a lax attitude from a certain State agency. The distance a radar can see is determined directly by the height of the antenna and the altitude that an aircraft is flying. For normal transit traffic above FL300 just two primaries would be good enough. The lower an aircraft flies the short the detection range, looking at low level of 200ft there would be a need of 8-9 primary radars to ensure full coverage. Having said that they need not be large primaries like an FPS117 or Giraffe-8A, between the primaries there can be medium range radars like the Giraffe AMB. This is due to the radar shadow which has been pointed out already.